The Vita Gets a Much Needed Dose of Tomba! 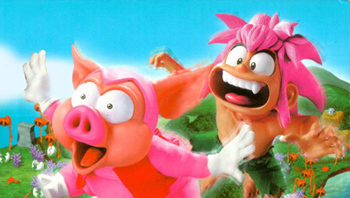 The Vita will soon be able to play a selection of PSOne classics, including Tomba! Tomorrow's Vita firmware update will include support for a batch of PSOne classics. Sony plans to roll out support for the substantial library of PS1 games available on PSN gradually, and promises to eventually support "over 100" titles. It's not clear which games, or how many of them, will be included in this first batch, but developer, MonkeyPaw, has announced that five of its titles will be made compatible by the update. The two standouts are the excellent Tomba! (Tombi! for Europeans) and Zelda-sans-Zelda action adventure, Alundra. Also included are Vanguard Bandits and Arc the Lad one and two. When Sony announced its plans to make PSOne titles compatible with the Vita, it specifically mentioned that heavy-duty titles like Final Fantasy VII and Tomb Raider would be among the first to be made compatible, but their inclusion in this initial update hasn't been confirmed. While this is still a far cry from true backwards compatibility, Sony seems to be hoping the classic titles will bolster the Vita's library while it tries to get more 3rd party developers interested in the handheld. Any PSOne classics bought for the PS3 or PSP will be transferable to the Vita, should they be included in the compatibility update.